Despite rumors to the contrary, the Granada Hills' How's Market has not been taken over by Fresh 'n' Easy... yet. Pam Fitzgerald, at the How's corporate office in Pasadena, said that the chain is being sold piecemeal: the Torrance location will become a Super A Foods, and the Pasadena location has also been sold to a not-yet-identified buyer. The Malibu and Granada Hills locations are still up for sale, so there's still a little time to enjoy the comforting familiarity of How's. But soon, with the coming Sprouts Farmer's Market at Chatsworth and Zelzah and the impending transition of How's, by this time next year, the Granada Hills supermarket landscape will be a new and exotic place. Related posts: Hows It Going To End? Hate to see How's go, but I wouldn't mind a Fresh n Easy. I'd like a Fresh & Easy too. They have great give-back programs to schools and we are too far away to get credit from the Sylmar F&E. 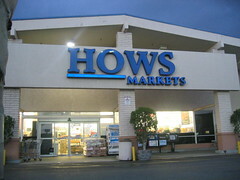 I love HOWS. It's the only place I shop. They have been great community members and both Matt Hughes and Mark Oerum have sat on the board of Granada Hills North Neighborhood Council in the small business seat. I never heard the Fresh & Easy rumor. All I ever heard is what is posted above. The stores were for sale and they are scheduling their employees by the week - not even a week ahead. The worst will be if it sits vacant which is what it was for the first 2 years that I bought my house here. It was just an empty building and having HOWS there was so convenient. We'll miss the tri-tip and the Broguiere's chocolate milk in glass bottles...always a fun trip with the girls. How's has been in its death throws for the last number of months. The dramatic decline in the quality of meat and produce, the loss of all the familiar faces, and the general attitude there make it all to clear that How's is on life support and terminal. We finally stopped shopping there about 4 months ago. I see no point in paying higher prices for less. It would be nice to see it finally over and replaced with a decent alternative. I don't believe the Fresh N Easy rumor but that would be a good fit. However, that entire Knollwood shopping area needs a serious makeover before anything else can be viable there. It's starting to look like the Granada Hills Village North shopping area on a bad day! Many may already be aware of this but when we stopped by Hows Tuesday evening the 22nd it was closed. There was a large banner in front of the store that read “Total Store Liquidation Sale”. On the door was a sign that said that everything had to go and was 35% off, and that their hours are now 9am to 6pm. Looking in the door I could see that the meat and produce departments were already completely bare. I don’t know if they have sold the store or are simply shedding their lease before next month. Someone posted on the Granada Hills North Facebook page that Vallarta is moving in, is that true? Baseless rumor. According to Eric Oerum, Granada Hills store manager, a switch to Vallarta is "Not gonna happen." As of now, there is still no scheduled close date and no buyer, but they are reviewing offers. Fact checking, people! something is being put in the old spot. There is a lot of construction going on there. Any one know what is coming?